Last December, Pope Francis declared Peter Faber a Saint and some want to declare Fr. Faber to be the Patron Saint of Business. Attached here is a wonderful document on the Spirituality of Peter Faber by Severin Leitner that was graciously provided by Claire Bangasser, one of my favorite writers. “Peter Faber (Pierre Favre) was born in 1506 in Villaret, Savoy in the south of France. As a boy, he looked after his father’s sheep in the French Alps. While tending sheep during the week, he taught cathechism to children on Sundays. Aware of his call to be a priest, he longed to study. At first, he was entrusted to the care of a priest at Thones and later to a neighbouring school at La Roche-sur-Foron. With the consent of his parents, in 1525 he went to the University of Paris. It was here that he discovered his real vocation. He was admitted to the College of Sainte-Barbe where he shared lodgings with a student from Navarre called Francis Xavier. They became close friends and graduated on the same day in 1530 with a master of arts degree. Peter also met Ignatius Loyola at the university and both Peter and Francis came under his influence. While Peter taught Ignatius the philosophy of Aristotle, Ignatius directed him in the spiritual life. Peter was ordained priest in 1534, the first priest in Ignatius’ group, and was celebrant of the Mass on 15 August of the same year at which Ignatius and his companions made their vows of poverty, chastity and obedience with the intention of going to the Holy Land. Soon three more became members of the group. After Ignatius, Peter Faber was the one for whom the companions had the deepest respect because of his knowledge, his holiness and his influence on people. Leaving Paris on 15 November 1536, Peter and the companions met up with Ignatius in Venice in January 1537. They planned to evanglise in the Holy Land but the instability of the region made it impossible. So they now decided to form a religious congregation and went to Rome where the Society of Jesus was approved by Pope Paul III in 1540. After some time preaching and teaching in Rome, the pope sent Peter to Parma and Piacenza in Italy where he preached the Gospel with success. 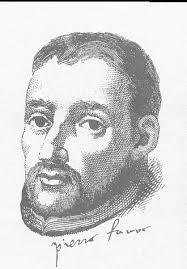 He was then sent to Germany to defend the Catholic faith against the Reformers at the Diet of Worms in 1540. From Worms, Peter was called to another Diet at Ratisbon in the following year. He was disturbed by the unrest caused by Protestantism but even more by the decadence of Catholic life. He saw that what was needed was not discussion with the Protestants but the reform of the Catholic Church, in particular, the clergy. He spent a successful 10 months at Speyer, Ratisbon and Mainz. He influenced princes, prelates, and priests who opened themselves to him and amazed people by the effectiveness of his outreach. Recalled to Spain by St. Ignatius, Faber left the field where he had been so successful and on his way won over his native region of Savoy, which never ceased to venerate him as a saint. He had hardly been in Spain six months when the pope ordered him back to Germany. He spent the next 19 months working for reform in Speyer, Mainz, and Cologne. Gradually he won over the clergy and discovered many vocations among the young. Among these was a young Dutchman, Peter Canisius who, as a Jesuit, would earn the title of Apostle of Germany. After spending some time in Leuven (Louvain) in 1543, he was called in the following year to go to Portugal and then to Spain. He was instrumental in establishing the Jesuits in Portugal. This entry was posted in Uncategorized and tagged Catholic, Catholic Saints, Chris Lowney, Claire Bangasser, Ignatian, Jesuit, Patron Saint of Business, Peter Faber, Peter Faber SJ, Pope Francis, St. Peter Faber. Bookmark the permalink.